Heathrow Airport has confirmed it will not be building a new terminal as part of its expansion plans, reports the Architects’ Journal. Chief executive John Holland-Kaye said initial plans had proposed the construction of an entirely new terminal – which would have been the sixth at the site – but now it was likely the existing Terminal 5 would be expanded instead. Some airlines bosses, notably Willie Walsh from British Airways owner IAG, have criticised the proposed costs of the new runway project because the the potential to push air fares up. “This reduces the cost of the project and improves passenger service and so we can deliver an expanded hub with a better passenger experience at a more affordable price,” Mr Holland-Kaye said. 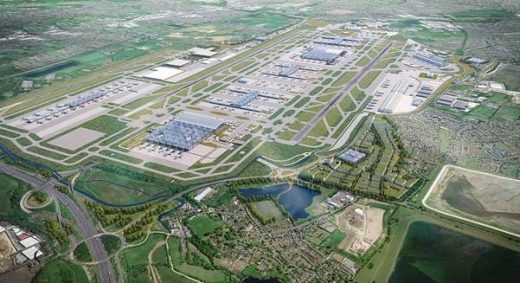 Benoy has confirmed its appointment to the future redevelopment of London’s Heathrow Airport this week. 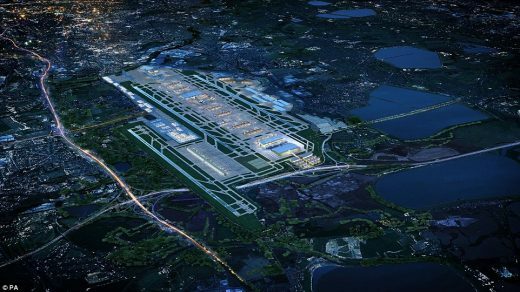 The British design firm will join the team delivering the Commercial Masterplan for Heathrow’s ambitious expansion plans which will see it transformed into a next-generation, world-class airport. Supporting the Lead Architect, Grimshaw Architects, Benoy’s commercial masterplanning scope will be site-wide and consider enhancement opportunities across each of the terminal areas. Earlier in the year, Benoy was one of four British firms shortlisted by Heathrow, alongside Grimshaw, Zaha Hadid and HOK, to deliver bold new ideas and conceptual designs to push the boundary of what Heathrow could be as the country’s global aviation gateway. “From the start of the selection process, we have shared and believed in the same outlook as our client; to blend a powerful people-centred approach within a convincing commercial and urban matrix. We are committed to seeing Heathrow continue to become a fully integrated and sustainable airport which will drive innovation and showcase the best of British design and can’t wait to get started,” said Tom. Benoy has been strengthening its presence in the Aviation sector since its work on the Hong Kong International Airport enhancement in 2010. The firm is currently delivering two of Singapore Changi Airport’s most high-profile future developments, Terminal 4 (T4) and new international attraction Jewel Changi Airport. Benoy is the Concept Design Architect and Interior Designer for T4 which will open at the end of 2017 and the Retail Interior Designer and Aviation Facilities Planner for Jewel. This year will also see Benoy celebrate its heritage as a British designer with its 70th anniversary. 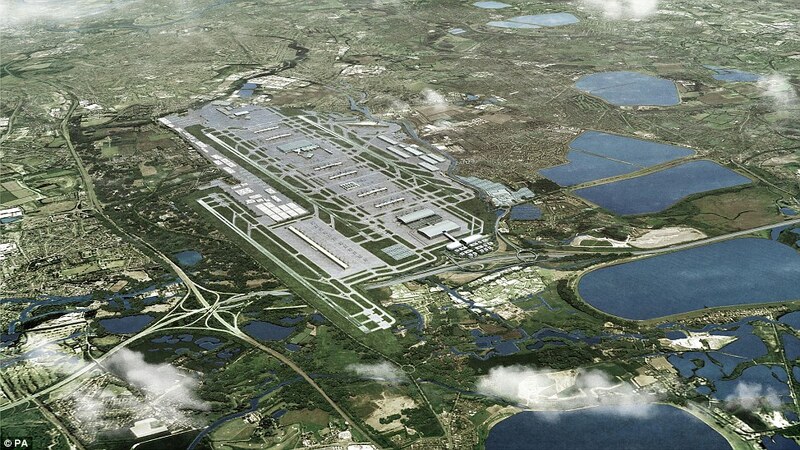 Heathrow Airport is preparing to submit a planning application for its £18.6bn third runway project in 2019. Between now and then there will be extensive consultation with local residents and other stakeholders on various aspects of the scheme including environmental impacts and project design. The first step is wildlife and other environmental surveys in the local area, starting in early 2017. The government said in October 2016 that a new runway at Heathrow was its preferred option for airport expansion in the southeast. The project is to be the subject of a draft ‘national policy statement’ that will go out for public consultation next year. The planning application is intended to be formally submitted in 2019, after the government has designated the national policy statement. Heathrow Airport expansion director Emma Gilthorpe stated: “Heathrow has its team in place, working to deliver the benefits of expansion in the most sustainable way. During the detailed planning process there will be lots of opportunities for local communities, industry partners and other interested parties to help shape our proposals. 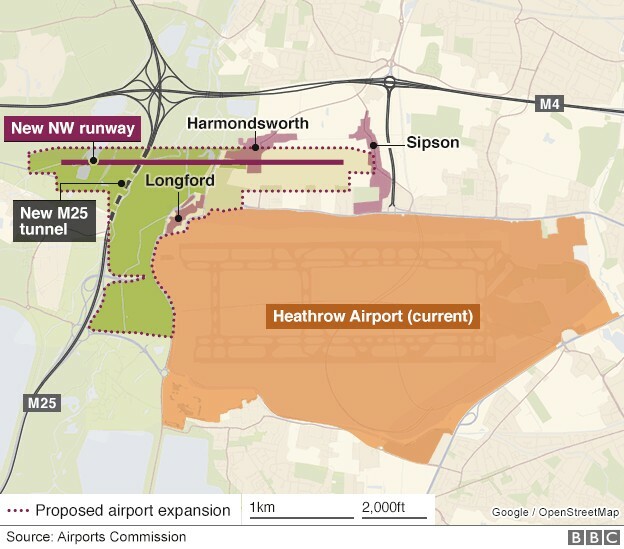 The government has approved a third runway at Heathrow to expand UK airport capacity, reports the BBC today. Transport Secretary Chris Grayling called the decision “truly momentous” and said expansion would improve the UK’s connections with the rest of the world. Both unions and business groups welcomed the decision to expand Heathrow. TUC general secretary Frances O’Grady said it was “absolutely vital for Britain”, while CBI chief Paul Drechsler said it would create jobs and boost economic growth. However Mayor of London Sadiq Khan said it was the wrong decision for both London and the UK. The Government’s decision to back Heathrow expansion is “wrong on every level, legally undeliverable and will end in failure after years of wasted of effort”, according to the leader of Wandsworth Council Ravi Govindia. The Government has today backed a third runway despite the west London airport already being by far the worst noise polluter in Europe and responsible for illegal pollution levels. Transport Secretary Chris Grayling has benched the rival scheme to expand Gatwick which offers a similar economic benefit to Heathrow, but with a fraction of the environmental damage. Solicitors jointly appointed by Hillingdon, Richmond, Wandsworth, Windsor and Maidenhead councils and Greenpeace UK are now examining the Government’s aviation announcement in detail and a legal strategy will be developed over the coming days. The campaigners have been preparing for a potential judicial review for the last 8 months as ministers have repeatedly refused to rule out the project despite clear evidence of the unlawful impact on surrounding communities. Cllr Govindia said: “This is deeply distressing news for the communities around this airport but this fight is far from over. Ultimately it will be for the courts to decide if this project goes ahead and the law is on our side. “The airport boasts illegal levels of air pollution, woefully inadequate transport capacity and has Europe’s worst noise footprint, and that’s with just two runways. Expansion will make all of these severely damaging issues worse. It’s wrong on every level, legally undeliverable and will end in failure after years of wasted of effort. “The chaotic and repeatedly fudged process leading up to the Government’s announcement is also wide open to challenge on multiple grounds. There has been no meaningful consultation and key information like the location of new flightpaths remain a secret even now. The work of the Airports Commission was also profoundly flawed and doesn’t not provide a sound basis for Government policy. Heathrow expansion is expected to have a major impact on Wandsworth by creating new flight paths across parts of the borough which have never experienced aircraft noise before. Expansion at Heathrow could cost taxpayers between £15 and £20bn according to Transport for London. Councillors argue that this vast sum could draw funding away from other valuable growth projects such as Crossrail 2 or extending the Northern Line to Clapham Junction. By contrast, Gatwick expansion is a self-funding project which would cost taxpayers nothing, while allowing them to reap the rewards of growth across the South London region. The flightpaths would run across more sparsely populated areas affecting far fewer people. Transport Secretary Chris Grayling will make a statement to Parliament around lunchtime on Tuesday. But the decision faces a long consultation before it becomes final. 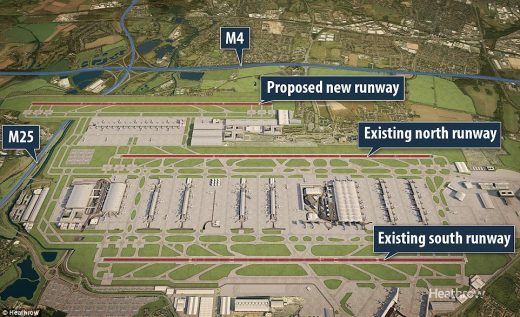 A study last year, led by Sir Howard Davies, recommended a third runway at Heathrow but other options include a new runway at Gatwick or extending one of Heathrow’s existing runways. Heathrow is already operating at 98% capacity and Gatwick is expected to run out of space in the next few years. Airlines and business groups favour expansion of Heathrow – Britain’s busiest airport – which offers more direct connections than Gatwick and handles more freight. Heathrow Airport has announced it will meet and, in most cases, exceed the conditions set out in the Airports Commission’s recommendation for its expansion. 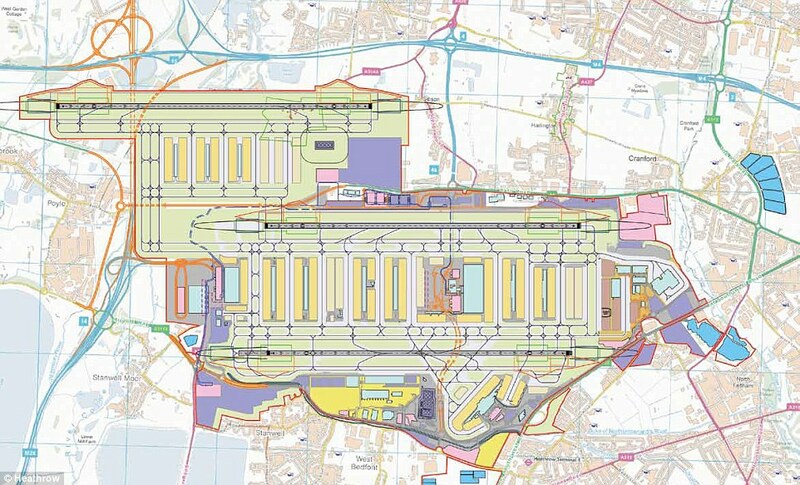 In July last year the independent Airports Commission unanimously recommended expanding Heathrow after a three-year, £20m study into the best option for maintaining the UK’s global aviation hub status. Today, Heathrow chief executive John Holland-Kaye has written to the Prime Minister setting out a plan which he says balances the national and local economic gain from expansion with a third runway with the environmental impacts. Heathrow, which is championing its cause over nearby rival airport Gatwick, has pledged to provide slots for a range of regional airports to operate domestic links with the London hub. And today, four of the UK’s leading architectural practices have unveiled pioneering new concepts that bring to life Heathrow’s vision for the expansion of Britain’s global gateway. Seeking to drive a step-change in global airport design, Heathrow challenged the architects to push the boundary of what an airport could and should be. They were asked to come up with bold ideas to create a world-class sustainable airport that would deliver innovations in passenger service, integrate local communities and showcase the best of British design. The shortlist of architects – which includes Grimshaw , Zaha Hadid, HOK and Benoy – was announced today alongside their visionary conceptual images. The next phase of the tender process will further test their creativity before a final concept designer is selected in July. “The visionary concepts are just the start of a dialogue which will fundamentally redefine what an airport is, how it looks and feels, how it interacts with its environment and an increasingly demanding generation of new passengers and importantly enhancing how it connects with the communities around it. A third Heathrow runway looks very likely to be added to the airport as part of a £17bn expansion plan – what buildings are proposed and who might the architects be? The last terminal at the airport was Terminal 5 (T5) by architects Rogers Stirk Harbour + Partners (RSHP) with YRM (no longer in practice). The terminal building was officially opened by HM Queen 14 Mar 2008. RSHP will be favourites to design any new buildings, though Estudio Lamela Arquitectos (Spain) or gmp – von Gerkan, Marg & Partners (Germany) could also be an option. 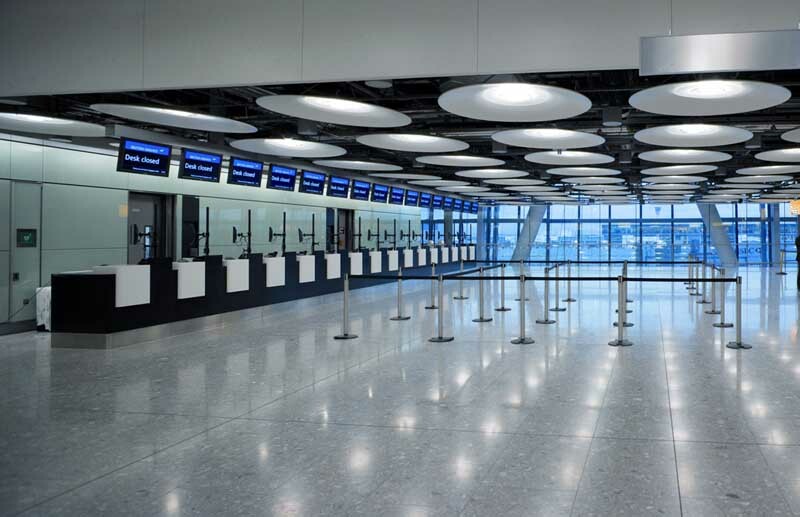 Two passenger terminals & transport hubs will be required for the third runway at Heathrow Airport. These will be connected by an underground passenger transit and baggage system. Minimum connection times between terminals to fall from 75 to 60 minutes. – Cargo facilities to be to overhauled and double their capacity. Our plans include climate-controlled cargo environments, improved transit facilities and dedicated freight access points including a potential cargo railhead. – Commercial developments such as offices and hotels: land will be set aside for these. It will provide more than enough space to replace commercial premises lost to the third runway. After nearly three years of deliberation the Davies Commission on airport expansion has given its opinion, reports the BBC. So what happens now? Out of three possible choices on the table, Howard Davies’ team has backed the idea of building a new third runway at Heathrow. So what is the plan? The plan involves building a new 3,500m runway about two miles north of the two runways Heathrow already has at an estimated cost of £18.6bn. 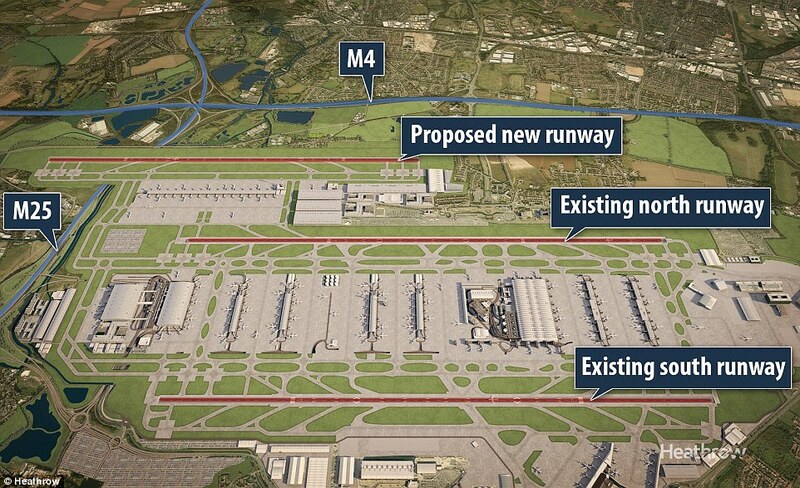 The Commission said the idea of extending one of Heathrow’s existing runways was less advantageous. Airport Watch, a group opposed to airport expansion that might harm the environment, has said more effort should be made to utilise existing capacity. And the Aviation Environment Federation has said the idea the UK is facing an airport capacity crisis is a myth.